People do weird things. This is especially noticeable when they are doing something outside their normal routine, like traveling. 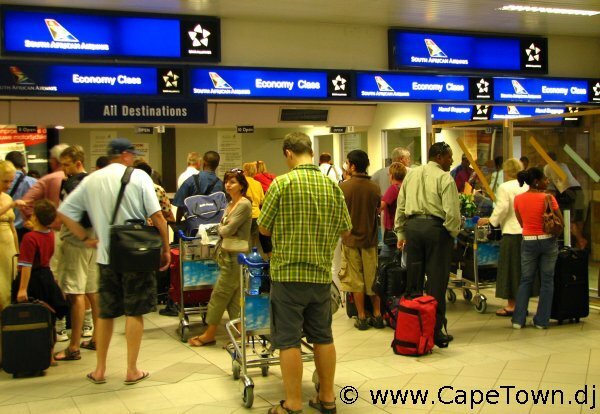 I was at Cape Town airport on Sunday to catch a flight to John’s Beg. The new terminal is well-appointed with bars, bookshops, restaurants, tea rooms and even has free Wi-Fi on offer. It also has enormous, giant, huge plate-glass windows through which it was hard not to notice the oil-stained, empty tarmac where our aeroplane was supposed to be parked. When boarding time came, however, that did not stop people from forming a long queue at the gate, like cows waiting to be milked. Why? Surely the most dim-witted traveler knows that it is not possible to board an absent aircraft. Even if it arrives right now, the arriving passengers have to be disembarked and the cleaners go through the plane on their chicken parade before you will be allowed to board. And it may not come right now; in fact, it may never come at all. So why stand for an indeterminate length of time in a queue when you could be enjoying a glass of wine at the bar, or browsing in the bookshop, or tucking into some delicacy in a restaurant, or look! there are comfortable armchairs and sofas in which you are permitted to sit and chat or just daydream. Once in the air the idiocy continued. As soon as the seatbelt signs were extinguished a whole bunch of passengers stood up to form another queue at the plane’s toilet. People, there are plenty of toilets at the airport, and they let you use them free of charge. So why wait until you’re on the plane where you are going to clog up the aisles with your horrible carcasses and prevent the flight attendants from doing their duty, which is serving me drinks. It’s only a two hour flight and I require prompt service if I’m not to have to rush the last of my three dinkies of wine and give myself heartburn. I’m a bit deaf so when the entire passenger complement stood the instant the plane came to a stop at the terminal I thought perhaps the national anthem was being played. But no, it was just another manifestation of weirdness. It’s quite comical to see a hundred-odd people leaping to their feet and standing bent over beneath the overhead lockers like a mass audition for the part of the Hunchback of Notre Dame, when they could be sitting down comfortably for the few minutes until the door is opened and they can disembark. Whilst waiting for the delayed plane to arrive I did a quick informal survey of the laptops that came within eyeshot of my barstool. There were: 5 Macbooks, 4 PC notebooks (3 Windows and 1 Linux). Out of 9 machines only 3 were Windows? Granted, this isn’t a very big sample, but could it be that people are starting to recognise Windows for the steaming, malodorous, maggot-heaving pile of crap it is? Or were the Windows users the ones standing in the queue waiting to board the non-existent plane? Would you cater a huge party for all your friends and acquaintances, buy a flash new car and poke your boss in the eye and tell him what to do with his crappy job all on the grounds that you may win the lottery next Saturday? No, of course not. That would be insane. But something similar was done by a company recently. Let me tell you about it. Software is a strange commodity. The first copy of it is incredibly expensive: in order to produce it you have to pay designers, developers and testers, pay rent on offices for them to work in, pay for all the support serices they require and so on. But once they have done their work, each additional copy of the software is essentially free to produce, which is why piracy is a problem. As a software business, you can either charge a fee to licence each copy of your software which you hope will pay your development costs and leave something over for profit (a la Microsoft) or, and this is quite a recent business model, you can give the software away for free and sell services related to the software. This is the model adopted by Red Hat and Canonical, for example. One of the advantages of this business model is that since you are giving the software away free of charge, you can also make the source code public. This has the effect of dramatically reducing development costs because a community comes into being which does a lot of development and testing for you without you having to pay any of their costs. Open source software is continually evolving as it is modified by the community, which arguably results in higher quality overall than the proprietary model. The open source software company acts as a gatekeeper, making the decisions as to what changes made by the community to include in their distribution. This is what Canonical does. It distributes Ubuntu (and its derivatives Kubuntu, Edubuntu, Medibuntu) which is an open source, Linux based operating system for PCs and servers. It is an alternative to Microsoft Windows. Now imagine that Canonical is an eighteen-wheeler pantechnicon barrelling down a deserted country road. Imagine that the Ubuntu community has discovered a giant, gaping abyss where the road has been washed away. They know the Ubuntu pantechnicon is on its way, so they stand in the middle of the road waving their arms and shouting. The huge, gaping abyss was a critical regression in the new version of the software called Karmic Koala, released in October 2009 as Ubuntu 9.10, the lunatic in the middle of the road was the Ubuntu community, and the driver of the truck was Canonical’s management team. (For those interested the bug meant that a lot of 3G modems stopped working on the new version of the software, which turned a lot of people’s computers into very expensive typewriters.) The community warned Canonical that there was a critical flaw in the new software long before it was released, but Canonical management decided to go ahead with the release anyway, hoping that their developers would be able to come up with a patch for the bug sooner rather than later. They didn’t. Four months after release the bug remains unfixed and there are thousands (millions?) of former Ubuntu users who have switched to other operating systems. Not only has this reduced Canonical’s revenue stream (fewer users equals lower demand for support services), but because Ubuntu’s reputation has been badly damaged, future revenue streams are also adversely affected. Canonical is not a public company, so there will be no shareholder revolt at the next AGM, but I sincerely hope for Ubuntu’s sake that the incompetents that let wishful thinking guide their actions are thrown out and Canonical and the Ubuntu community can move on without any repetition of this sort of debacle. You are currently browsing the Grumpy Old Man blog archives for March, 2010.